U.S. Travel Association is running an ad campaign throughout the presidential election to show the positive economic impact of travel. WASHINGTON: The Democratic and Republican conventions bring thousands of travelers, media, and lawmakers to a single city for a week. The U.S. Travel Association is capitalizing on the huge influx of visitors to Cleveland and Philadelphia with an ad campaign promoting travel. U.S. Travel is trying to show lawmakers what an important economic impact travel has. 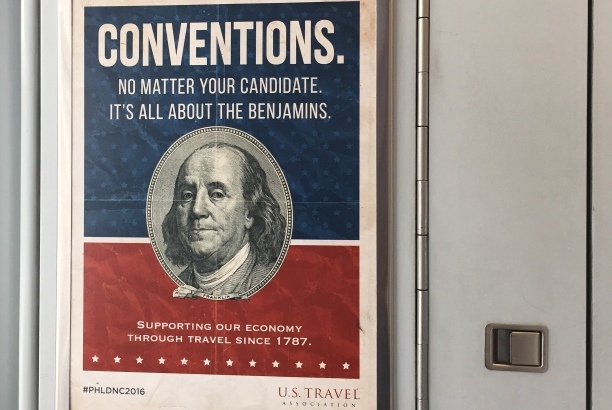 It is running ads in Cleveland Hopkins International Airport and on Amtrak trains between Washington, D.C. and Philadelphia. U.S. Travel is also partnering with Politico’s Hubs at both conventions. "Travel is viewed as frivolous and fun by many," said Jonathan Grella, public affairs EVP at U.S. Travel. "Our challenge as an industry is to make the point that we’re more than fun; we’re serious business." The ads make the point that travel makes money, and include taglines such as: "Conventions. No matter your candidate, it’s all about the Benjamins" and "From the roll call to the last call. Travel creates jobs." U.S. Travel also did research to support that claim. It projected that the conventions will make an estimated $360 million in their host cities. The campaign has been following the presidential election. It began in February at the New Hampshire primary, and then went on to South Carolina, Florida, and Michigan. The campaign will continue through the final presidential debate in Las Vegas in October. "The common denominator between them is not just the campaign, but states with a strong travel economy," Grella said. "We went to venues that were travel-flavored, like hotels, airports, convention centers, and trains. We’re striving to make this clever point in places where travel was strong and in settings that were intimately connected to travel." U.S. Travel developed the campaign in-house, with a core team of about six led by Grella. The main goal, he said, is to drive home the point that big gatherings, such as conventions and debates, create jobs and strengthen the local economy. "The ROI on travel is a lot better than other industries," Grella said. "The point of all this is to elevate our industry and make sure those who matter understand what impact travel has."